These gold shorts with sequins and white trim make great christmas shorts or shorts for a special occasion. For babies, toddlers and little girls or little boys. 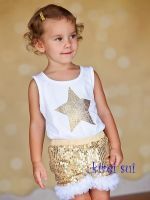 Sizes: XS 8.5" Long (age 1-2) Waist is 20" - 21"
Sizes: S 9.5" Long (age 3-4) Waist is 21" - 22"
Sizes: M 10.5" Long (age 5-7) Waist is 22" - 23"